The kids are back in school, Craig is back in Abuja and the Christmas jumpers are, thankfully, back in the floordrobe. 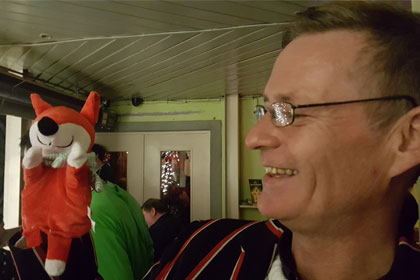 And as you can see, Craig brought a friend over from Nigeria to the party in the Oarsman – not sure yet if he bats or bowls but he looks like a good fit for the Fifths. The year has turned and those of us in the northern hemisphere can only look on with envy at our members enjoying cricket in the sun. As I write this, the Irish Ladies have qualified for the ICC Super Sixes in Sri Lanka and will be playing Bangladesh, Pakistan and South Africa this week in a bid to qualify for the World Cup in the summer. I’m sure I speak for all our Pembroke family when I say that we, as a club, are so proud of the achievements of Louise McCarthy, Shauna Kavanagh, Meg Kendal and Kim Garth and, of course, Ciara Metcalf who is currently on loan to The Hills. It’s great to see Kim continue on from her stint in Australia where she helped the Sydney Sixers win the Big Bash in January. Its no surprise that our young players are continually coming to the fore and along with our Ladies we have seen Lorcan Tucker and Josh Little break into the Irish squad over the winter. As a club we pride ourselves in developing our own talent and I am delighted to announce that we have secured the services of Andy Balbernie as Youth Development Coach in Pembroke. Andy knows what it takes to come through the underage system at the club and he joins a very talented team with Peter Prendergast and Conor Hoey as specialist batting and bowling coaches. Andy will take up the post when he returns from Irish international duties and we wish him well next month against Afghanistan. In addition to welcoming Andy on board we are also excited to have Nick Cutler as our overseas player this season. Nick plays for Western Suburbs in Sydney, Australia and is ranked in the top 10 batters this season. I’m sure you will all welcome Nick and make him feel at home in Pembroke. As Nick arrives we say farewell to Daniel Solway – Daniel is trying to further his career in Australia by landing a State contract so the best of luck to him with that and our sincere thanks to Sol for his contribution on and off the pitch last season. I also want to say a small farewell and big thank you to Guy Chilton. Guy has been instrumental in making our Awards Night such a superb way to end the season and he has been helping to run this for 14 years. This year Guy has decided that he needs an easier challenge so he is entering the Ironman competition in Copenhagen in September. Hopefully, he will bring a trophy home to show off at next year’s Awards Night. Date for your diary: Indoor nets return on Sunday 19th February until 2nd April in St. Andrews school in Booterstown. The times are: 1st Team Squad – 12pm to 2pm, Youth – 2.15pm to 3.45pm, Everyone else 4pm till our knees give out. To further celebrate our youth development, here are some photos of our Ladies internationals in their formative years (sorry Meg, I didn’t get on to your family in time! ).